What kind of day was it… that day, December 7, 1869, when two members of the James Gang rode into Gallatin, robbed the Daviess Country Savings Association and shot and killed the casher, Capt. John W. Sheets? At the southeast corner of the town square stood a small brick store house. It was one story high, had a pitched roof, two windows on the north side, a door in front, and a door and window on the south. This little building had a look of sturdiness about it, an air it may have acquired from once being a bank to which was entrusted the earnings and savings of many of Gallatin’s thriftiest citizens. Within its not overly lofty walls, statesmen, financiers and tradesmen came to deposit their wealth or draw upon their credit from the little iron safe that stood in the back room. Here came slender-fingered women who received from the cashier small sums in payment of drafts and grimy mechanics to receive their weekly wages. The little bank was a blessing and many blessed it, for it was a paved way from want to procurement. In 1869 Gallatin was a county seat town of less than 1,000 people. There was a public square built around a two-story brick courthouse. The courthouse lawn was surrounded by a fence with built-in hitching posts to accommodate horses, buggies and wagon teams coming into town to do their trading and business. Around the square, with its board walks and muddy streets, were various business establishments and professional offices. There was a three-story public school house one block from the square. The tower on top of the building had a bell that could be heard for five miles. On the southwest corner of the square was the Daviess County Savings Association. Everyone still called it “the bank,” as that was what it originally had been. 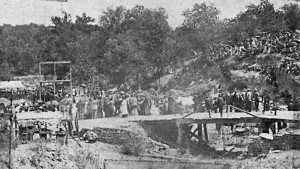 On December 7 the little town was going about its business unaware of the tragedy that was to strike within the next few hours — a tragedy that was to put Gallatin, Mo., forever on the map and was to be written in journals and novels for years to come. Not too far away, Jesse James and his brother, Frank, guided their horses toward the little town. Although they would rob the bank of $700 while there, Jesse James had but one thought on his mind. He was going to Gallatin with the sole purpose of killing a man. Capt. John Sheets was murdered during the 1869 robbery of the Daviess County Savings Association, apparently a victim of mistaken identity. John W. Sheets was born in Jefferson County, Va., in 1818. He was one of six children born to Henry and Mary Sheets. When he was still very young, the family moved to Missouri and settled in Daviess County. They were among the early settlers and his father was one of the organizers of the town of Gallatin, founded in 1837. In Gallatin, Henry Sheets practiced his trade of gunsmith. County records, the U.S. Census and family records show that Capt. Sheets was married to Martha Casey on October 30, 1850. There were two children born to this union, Ernest and Mary. Their mother, Martha Sheets, died before 1860. The 1860 Census shows John W. Sheets and children living in the household of Jonathan Mann, a merchant. In 1860 he was married to Mary Clingan, daughter of Major Thomas Clingan, a prominent businessman. Sheets served as sheriff of Daviess County for two terms, circuit clerk for six years, county recorder for four years, and also as county commissioner. He was an honorable man and was held in high esteem by the citizens of Daviess County and the town of Gallatin. He served the people faithfully and well in his many years in office. He was also a civic-minded man and was an active participant in all of the activities of the town. His war record shows that he was a volunteer in the war between the United States and Mexico in 1846. He and Major Samuel Cox were members of Company D. He also fought in the Civil War under the command of Major Cox on the Union side. It was in the Civil War that he earned the rank of captain — a title that stayed with him the rest of his life. William T. Anderson (1840 – Oct. 26, 1864) — known as “Bloody Bill” Anderson — was one of the deadliest and most brutal pro-Confederate guerrilla leaders in the American Civil War. 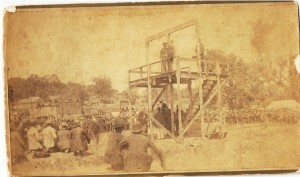 Anderson led a band that targeted Union loyalists and Federal soldiers in Missouri and Kansas. He was killed in a Union ambush near Richmond, MO. On October 26, 1864, Wm. “Bloody Bill” Anderson and several of his men were killed in a Union ambush at the Battle of Westport, near Orrick in Ray County. Major Samuel Cox was the commander in charge of the Union ambush and John Sheets was one of his troops. Bloody Bill Anderson rode with Quarterly’s Raiders during the border war between Kansas and Missouri and was later a captain in the Confederate Army. Jesse James was 16 when he joined Quinter’s Raiders and rode under Bloody Bill’s command. He was in the Battle of Westport when Anderson was killed and swore that Major Samuel Cox was the man who had shot Anderson in the skirmish, and that someday he would kill Cox. It was Major Samuel Cox he intended to kill that foggy morning he rode into the little town of Gallatin. He had been told Cox was a cashier at the local bank. What he did not know was that his source of information had confused Major Cox and Capt. Sheets, who both lived in the small town, to be the same man. Maud Clingan Fitterer, a relative of Mary Clingan Sheets and a neighbor of mine for several years, told me that Mary’s account of the day of John’s murder had been handed down by relatives. Maud was only two years old when Mary Sheets died in 1878, but she remembered the women in her family talking about the murder and how difficult the senseless crime of Jesse James had been for Mary, John’s children, and the other members of the family. Mary had told them she would never forget a single detail of that day, even to what she had made for breakfast. On December 7, 1869, Gallatin began to come to life shortly before daylight. Chimneys belched smoke from freshly stoked fires that had died down through the night. Lights from the lamps appeared in the houses throughout the town. According to Mary’s account, Capt. Sheets arose at his usual time at 6:45 a.m. He pulled himself out from under the covers, leaving Mary to sleep a little longer. In his long underwear and slippers, he went into the big kitchen, lit the lamp and started a fire in the wood cook stove. He put on the teakettle to heat water for coffee and shaving, then he went back to the bedroom to dress. As he sat on the side of the bed, Mary stirred and turned over. She reached up and pulled him down to her and they lay for several minutes embracing each other. They had been married only nine years and were still very much in love. While Capt. Sheets shaved at the commode in the corner of the kitchen, Mary fixed breakfast. She got a roll of homemade sausage from the side porch, fresh butter, eggs, milk and home-canned raspberry jelly from the pantry. For breakfast there was sausage, eggs, hot biscuits, gravy, butter and jelly, washed down with strong black coffee. After breakfast John put on his boots, coat, hat and gloves to go to work. At the door he held Mary and kissed her goodbye. She stood in the door and watched him as he went down the brick path to start the 10-minute walk that would take him to the bank. So, for Capt. John W. Sheets, the day had begun. When Capt. Sheets reached the main part of town he did not go directly to the bank. It was his daily ritual to walk around the square and visit with the merchants and greet the citizens on the boardwalk before going to work. Already there were a few horses and one wagon team tied to the hitch rack around the courthouse. Two black men pushed carts in the street, shoveling up manure and debris from the day before. Shopkeepers were opening their establishments for the day’s business. Children were coming from all directions in heed to the big bell ringing in the schoolhouse tower, the younger ones being escorted by parents or older brothers and sisters. It was into the first week of December and merchants around the public square were displaying their special wares for the coming Christmas season. Shop windows were decorated with garlands of holly, paper bells, candy canes, Santa’s, bittersweet, pine cones, wreaths from pine tree boughs and other decorations gathered from the surrounding countryside. Mann & Crain Dry Goods Store on the east side of the square had a display of china dolls, dressed in the mode of the day, shipped all the way from Chicago. There were also rag dolls, dolls with leather bodies, wooden toy soldiers, story books, a wicker doll buggy, toy guns and rocking horses and many other toys to catch the fancy of bright-eyed children. Thomas J. Osborn was displaying a brand new buggy in his hardware store. There were also sleds and toys. The grocery store had small barrels of hard candy, many different kinds of nuts and all the ingredients needed for holiday baking. A freshly butchered hog’s head dangled from a hook outside the butcher shop, the blood dripping into a box of sawdust below. No doubt some thrifty housewife would buy it before the day was out to make up into mincemeat for Christmas pies. As Capt. Sheets was completing his tour on the south side of the square, he saw two of Gallatin’s attorneys, W.C. Gillihan and William McDowell, coming from the courthouse. He waited for them as they gingerly picked their way across the street trying to avoid the manure and the mud holes. Circuit court was in session and there were several cases on the docket to be heard. The lawyers were taking a break while waiting for their cases to come up. Capt. Sheets joined them as they went into the Clingan House Hotel and Restaurant for coffee. The sign on the front of the building read: Clingan House – Major Thos. Clingan Prop. – best Northwestern Hotel – Table Set with Best in County – Clean Beds and Stables. Between 8:30 and 9 the men left the restaurant, and Capt. Sheets crossed the street to the bank on the southwest corner of the square. Throughout the morning he was busy taking care of customers and bank business. Around 11:30 William McDowell came into the bank. There were no customers in the bank at the time and many of the merchants were closing their shops to go to dinner. Sheets and McDowell sat down in some chairs in the front and visited. At about the same time, Solomon McBryer and a hired hand were mending fence on the McBryer farm about three miles south of town. In the distance they heard horses running over the frozen ground. The fog that had prevailed all morning had begun to lift on the hillside but was still dense in the low-lying areas. In the clearing below they could barely make out horses and riders. They could not see well enough to determine the kind of horses nor how many riders there were. About 30 minutes later two men rode up to the bank building, tied their horses to a hitching post and entered the bank. Capt. Sheets got up and went behind the counter to wait on them. The first man asked Sheets if he could change a $100 bill, that he owed the other man some money and needed the change to pay him. Sheets said he could and went into the back room to get the money out of the safe. The man followed him into the room. The second man asked McDowell for pen and paper so he could sign a receipt for the money paid him. As McDowell went behind the counter to get the pen and paper there was a gunshot. He turned quickly and saw the first man, with gun in hand, standing over Capt. Sheets, who was lying on the floor. As he turned and started for the outside door, he heard another shot. The second man stood between him and the door with his gun drawn. McDowell made a lunge for the gun, stumbled and fell as the shot went over his head. He scrambled to his feet and ran out the door, dodging the gunman’s bullets and yelling for help. Aroused by the shooting and McDowell’s yelling, the merchants that were still in their shops and the few citizens on the square grabbed their guns and went running toward the bank. The bandits came out of the bank with their guns blazing and the citizens pulled back. As the men tried to mount their horses, one of the horses broke loose and took flight. The other bandit came back and pulled him up behind and they left town on one horse. When the citizens got into the bank, they found Capt. Sheets lying in a pool of blood on the floor. A doctor came hurrying across the square and went into the bank. It is not recorded what doctor attended Capt. Sheets. Some of the doctors known to be in practice at that time were G.W. Brosius, John Cravens, W.M. Givens and W. Fomsbee. John Adkins was coroner, and it is assumed that he was also in attendance. The doctor’s examination showed that Capt. Sheets had been shot twice, once in the head and once through the heart. The doctor pronounced him dead and gave permission to move the body. Someone had brought Capt. Sheets’ wife, Mary, to the bank. As she knelt on the floor beside her husband, cradling his head in her arms, her anguished cries could be heard throughout the square. As people stood solemnly by, shocked and disbelieving relatives and friends carried his body from the bank to the residence. For Capt. John W. Sheets, the day and his life had ended. Major Samuel Cox was getting his hair cut in Wm. Irwin’s barber shop on the east side of the square when the gunshots and commotion started on the other side of town. Everyone ran out into the street to see what was going on. Major Cox hurried on over to the west side toward the shooting. The assassins were already gone and Sheriff William Flint was rounding up all of the men who had horses nearby to go after them. He sent two of the men after the horse that got away and the rest he formed into a posse. Major Cox got his horse and joined the posse. Just outside of town, the bandits met David Smoot riding toward town. They forced him to dismount and took his horse. Farther on down the road, they overtook a minister and forced him to guide them around the nearby town of Kidder. Sheriff Flint’s posse scoured the countryside in every direction, but there was no trace of the two men. The James boys were famous for their fast horses, straight shooting, and dodging posses. The citizens of Gallatin were positive that the two men who shot Capt. 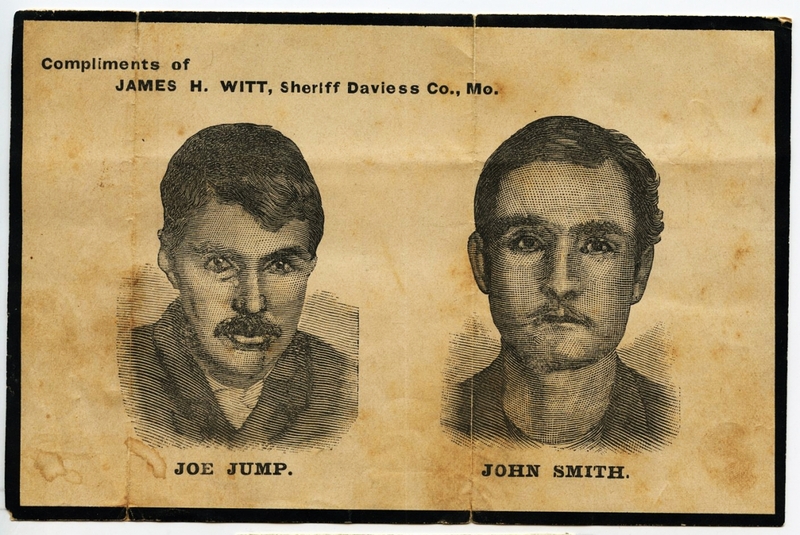 Sheets were the James boys and a reward of $3,000 for their capture was posted by the following: Mary Sheets, wife, $500; Daviess County Savings Association, $500; The City of Gallatin, $500; Daviess County, $500; the State of Missouri, $1,000. The horse that got away was caught soon after the robbery and it wasn’t long before the detective hired by the Gallatin bank had positive proof that the horse belonged to Jesse James. With this proof, a Grand Jury was called and Jesse and Frank James were indicted for the murder of Capt. John W. Sheets. It was the first time the brothers had been indicted for murder, and “Wanted” notices began to appear throughout the state. From February 13, 1866, up to December 7, 1869, Frank and Jesse James, the four younger brothers, and other members of the gang had robbed six banks and killed six innocent men. Their first bank robbery was the bank of Liberty, believed to be the first daylight bank robbery ever committed. Their take from this robbery was over $24,000 in Union dollars and $40,000 in bonds. In that robbery Tally Wymore, a young college student at nearby William Jewell College, was killed. None of the gang members were ever arrested or indicted for any of the robberies or murders. 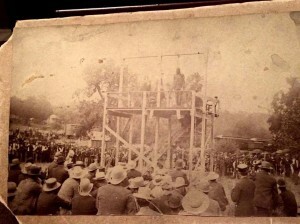 The governor of Missouri kept after the Liberty sheriff to bring the boys in for questioning. The sheriff made another attempt, but again he was out-maneuvered. He came to the conclusion that there was no way to bring them in. After the Gallatin bank robbery and the murder of Capt. Sheets, there was a lot of feeling stirred up throughout the area against the James boys. The brothers knew that Det. D.T. Bligh and his assistant William Gallagher were still on their trail. Bligh had been hired by the Russellville, Kentucky, bank, which had been robbed of $14,000 on March 20, 1868. Just as they felt they had nowhere to turn, they found a powerful ally in John Newman Edwards, editor of The Kansas City Times. He was a Confederate major in the war and was a champion of the guerrillas and their part in the Civil War. Edwards began to write editorials in The Times contradicting the presence of the James boys in Gallatin on the day of the murder. He printed signed affidavits of neighbors, friends and family swearing that Frank and Jesse were at home in Kearney on December 7, 1869. He also printed a letter from Jesse to the governor of Missouri denying that they had anything to do with the crime. Edwards kept up his barrage of editorials defending the James boys and praising their glorious records in the Civil War fighting for a cause they believed in. The power of the press worked. The governor of Missouri finally made a statement, printed in The Times, absolving Frank and Jesse James of any participation in the crime at Gallatin, Mo. They were never brought to trial for the murder of John Sheets. Although they were relieved by the governor’s statement, the brothers decided it was time to clear out. In 1871, Jesse, Frank, and Cole Younger went to Texas and bought a cattle ranch in the Pecos River country. Other members of the gang soon joined them there, and for the next several years the ranch became their home base. They continued their life as outlaws, spreading out all over the country and adding trains, stage coaches and government payrolls to their list of robberies. Authors and journalists disagree on many of the facts about the outlaws. However, most of them agree that Jesse James was the one who shot Capt. Sheets, and most of them say Jesse James admitted to many people that he was the one. He always claimed that Cox and Sheets were the same man, and so did some of the authors. February 14, 1878 — Mary Clingan Sheets, widow of the late Capt. John Sheets and daughter of Major Thomas Clingan, died Wednesday night of cancer. Mrs. Sheets had suffered from the disease a long time. She was 47. August 21, 1913 — Major Samuel P. Cox died at his home in this city last Friday night. He was 85 years old and had lived in Daviess County for 75 years. He was a potent factor in the development of this section. He was a successful merchant and a veteran of the Mexican and Civil wars. He had been a member of the Christian Church for 55 years. Burial was in Brown Cemetery. Capt. John Sheets and his wife, Mary, were buried in Lyle Cemetery in the southwest part of Gallatin. It was, as the Booneville newspaper reported, a bleak and dreary day — that day in December 1869 when Jesse and Frank James rode into the small, fledgling community of Gallatin, Mo. 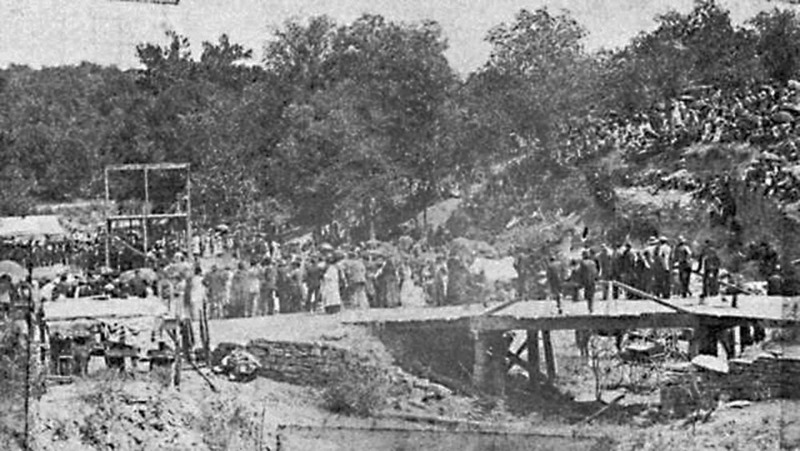 Jesse James is reported to have admitted many times during the following years that he and his brother, Frank, had traveled to the little farming town, about 40 miles from their home near Kearney, for one purpose — to kill Major Samuel Cox, the man he swore to get for shooting and killing Bloody Bill Anderson. Unfortunately, reports to Jesse James that the man working in the local bank, Capt. John Sheets, and Major Cox were one and the same were erroneous. Jesse and Frank James never paid for the crime they committed that day. But the descendants of Capt. John Sheets remember it well. It is a story handed down from generation to generation. It is a story about the day Jesse James rode into town for the sole purpose of killing an innocent man. A man he thought to be someone else. And his legend lives on. Sources: Missouri Historical Society, Daviess County Library, Liberty Public Library, Gallatin North Missourian, Gallatin Democrat, Leopards History of Daviess County, U.S. Census, county records, James gang novels, accounts from Maud Fitterer and Mary Frances Davis, Sheets family records.